Imbedded asbestos fibres irritate lung tissue around them, causing a number of diseases. Asbestos related diseases can take many years to develop. Most diseases will not become apparent for at least 10 years after exposure to asbestos and more commonly 15-20 years. Some diseases, such as mesothelioma may take up to 40 or more years to develop. Malignant mesothelioma is the most common of the asbestos-related diseases monitored in Australia. This is because there is a strong causal association between asbestos exposure and malignant mesothelioma. A total of 11,667 people were newly diagnosed with malignant mesothelioma in Australia between 1982 and 2009, with men making up 85% of all cases. Since 2003, approximately 600 cases of newly diagnosed malignant mesothelioma cases have been reported each year. 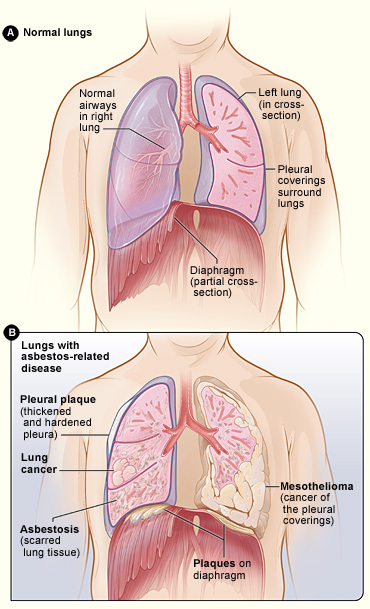 Mesothelioma is a cancer arising from the lining (mesothelium) of the thoracic and abdominal cavities. The disease is usually advanced before symptoms appear, making an early diagnosis and effective treatment very difficult. The average survival time after diagnosis is only 10-11 months. A small exposure to asbestos can be enough to trigger the cancer, however a relatively small percentage of people exposed to asbestos develop mesothelioma. There usually is a lag of 30-40 years after the first asbestos exposure before the disease is diagnosed. Exposure to asbestos fibres greatly increases a person’s risk of developing lung cancer, particularly if they are also a smoker. Park EK, Hyland R, Yates D, Thomas PS, Johnson A. Asbestos exposure during home renovation in New South Wales. Medical Journal Australasia, September 2013; 199 (6): 410-413. Olsen NJ, Franklin PJ, Reid A, de Klerk NH, Threlfall TJ, Shilkin K, Musk B, 5-Sept-2011, “Increasing incidence of malignant mesothelioma after exposure to asbestos during home maintenance and renovation”, Medical Journal of Australia, 195 (5): 271-274. Park EK, Hyland R, Yates D, Thomas PS, Johnson A. Prevalence of self-reported asbestos exposure during home renovation in NSW residents. Respirology Supplement 1, Poster 143. March 2010.